Competitive Collaboration Part 3 – How do we enable it? I wrote last week about what is Competitive Collaboration and why I believe it will save the world, today is about how we enable Competitive Collaboration between companies. I believe these three principles that are key to enabling Competitive Collaboration inside a company are also essential to creating Competitive Collaboration between companies. But the tricky part is that unlike enabling these principles inside a company where the key stakeholders are direct actors in the process, enabling these principles between companies will require stakeholders who are not directly involved in the process. Possibly, sorry I well change that, most definitely government. So let’s look at each of the principles. Social media has connected individuals, communities and companies together like never before. It would be fairly simple to enable a Competitive Collaboration feedback system for organisations. We see it almost everyday with feedback and comments on anything from hotel rooms, to restaurants to companies. Look at what is happening with the Divest movement at the moment – social media direct feedback to companies. 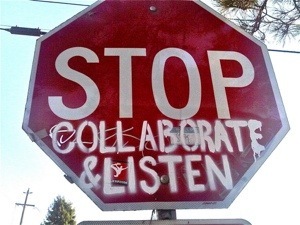 Enabling feedback from individuals, communities, companies and government to those that are collaborating with their competitors will accelerate the collaboration, make it visible, put it on the line and it will tap into the competitive nature of companies. Enabling more companies to start to collaborate with their competitors. Further fuel can be ignited through leaderboards. Highlighting those companies that are collaborating the most, or achieving the most beneficial environment outcomes through collaboration, can again fuel more collaboration. This is where the government is best placed to enable Competitive Collaboration, whether at local, state or federal level if companies are rewarded over and above for collaborating with their competitors for the betterment of living within the means one planet. Whether its removing red tape, allowing additional floor area or just direct financial benefit, incentivising competitors to collaborate would accelerate the benefits of this much needed step in the right direction. In the ecological model where ‘radical resource productivity’ is an essential part of the ecological innovation cycle enabling Competitive Collaboration is essential. Now matter who or where you are, you can be a key player in enabling this key driver for change. What will you do now?